Pack this smoky Chipotle Sweet Potato Soup in your lunch, or come home to a warm bowl on a chilly day. Serve with crispy polenta croutons and toasted sage leaves for a special meal. Paleo and vegan. 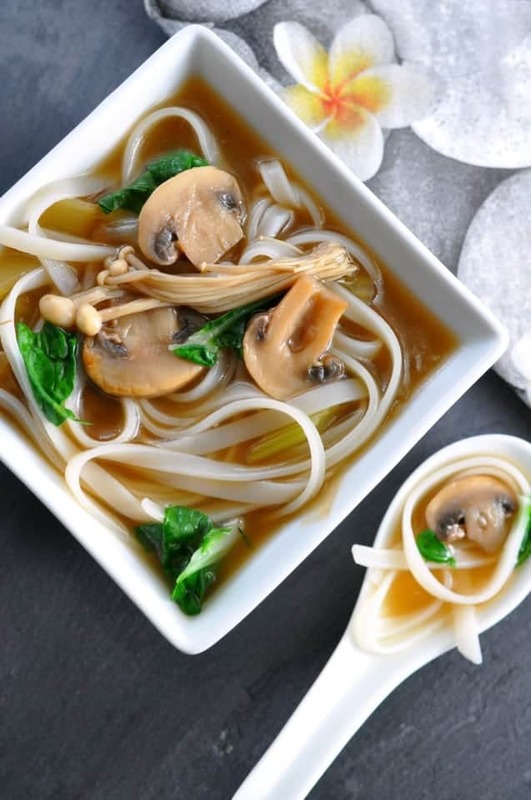 Is there anything better than a simple bowl of warm soup on a cool day? Think of it as a culinary hug. 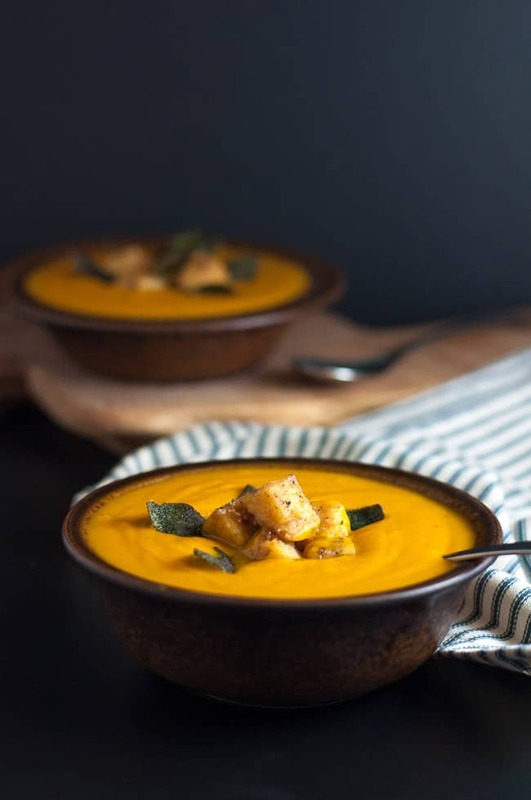 This smoky Chipotle Sweet Potato Soup has all the elements we crave in the fall and winter months: rich warm colour, smooth velvety texture, and a satisfying earthy spiciness. Colour, texture and taste aside, this soup is a powerhouse of nutrition. Sweet potatoes are low on the glycemic index scale and have very high levels of Vitamin A and fiber. While they contain more natural sugars than white potatoes, overall they have more nutrients and fewer calories. Despite their nutritional benefits, I just like the way they taste. 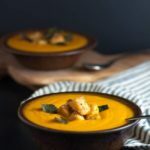 The first time I made this Chipotle Sweet Potato Soup, I was generous with the chipotle peppers, adding two full peppers and one tablespoon of the sauce. Bad idea. It was so spicy that it overpowered the flavour of the sweet potatoes. I held off the next two times, repeating my flavouring mantra: you can always add more later if you need it, but you can’t take it away! Let’s talk about these crispy polenta croutons. I discovered them topped on a chilled watermelon-tomato gazpacho at a local restaurant this summer. 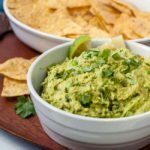 I loved their crisp texture and vowed to figure out how to make them at home. They’re so easy! I used store-bought prepared polenta (the kind that comes in a roll), sliced and chopped it into cubes, tossed it with a little cornstarch and salt and pepper and fried it in a couple of teaspoons of butter. 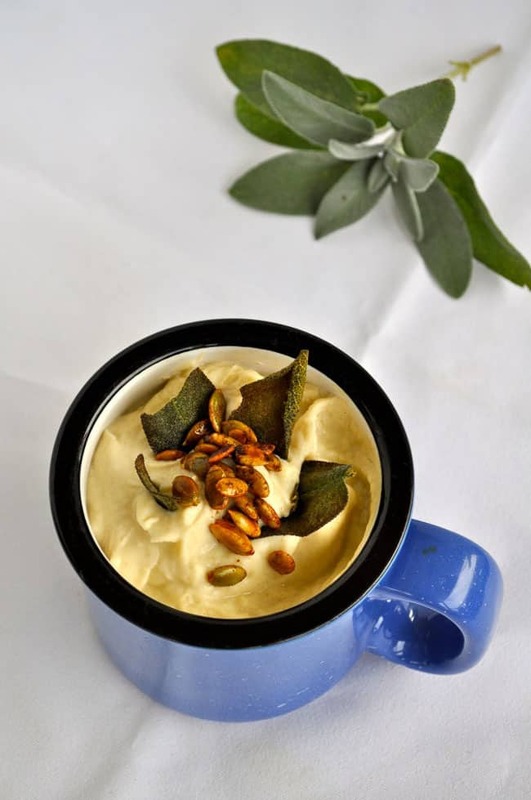 I love toasted sage leaves, and always make them when I make this Roasted Cauliflower Soup with Spicy Pumpkin Seeds, so I added a few of these to each bowl as well. Why should you make soup? 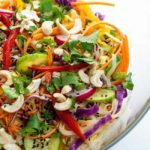 It’s an easy way to add more vegetables into your diet. Making food from scratch allows you to control what’s in the food your feed yourself and your family. Soup is quick to make and can be simmering on the stove or in a slow cooker while you prepare the rest of your meal. It’s convenient. Double the recipe and freeze half for another meal. It’s filling. 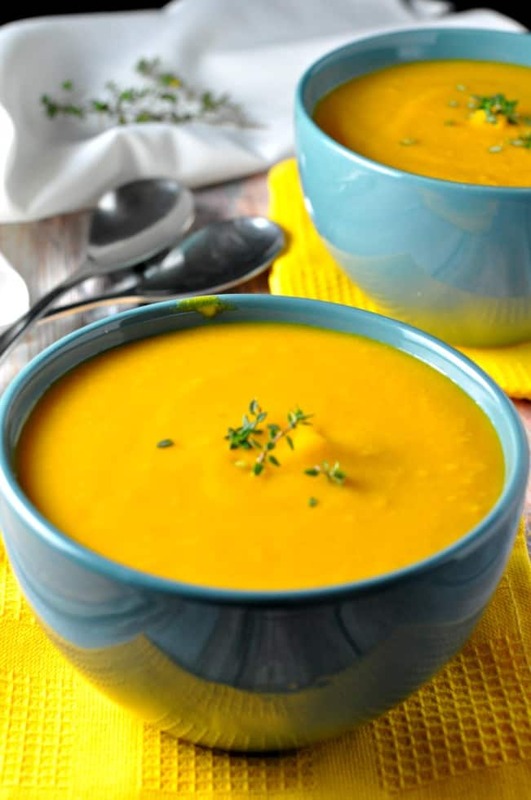 Soup contains a lot of water, so it makes us feel full without adding extra unnecessary calories. 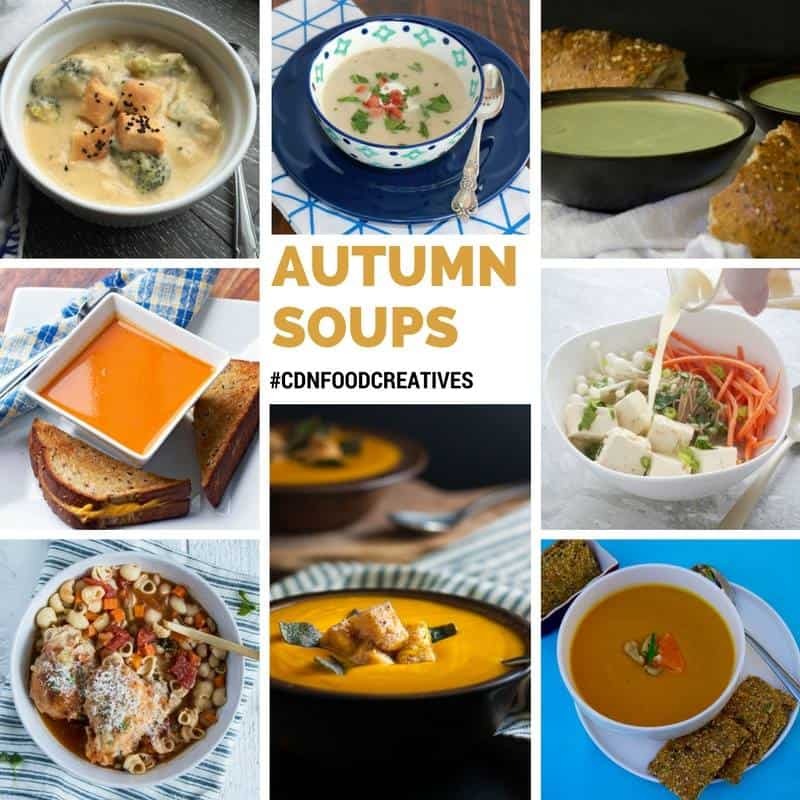 A bowl of soup has to be eaten slowly, encouraging us to savour each spoonful and eat mindfully. It’s comforting. 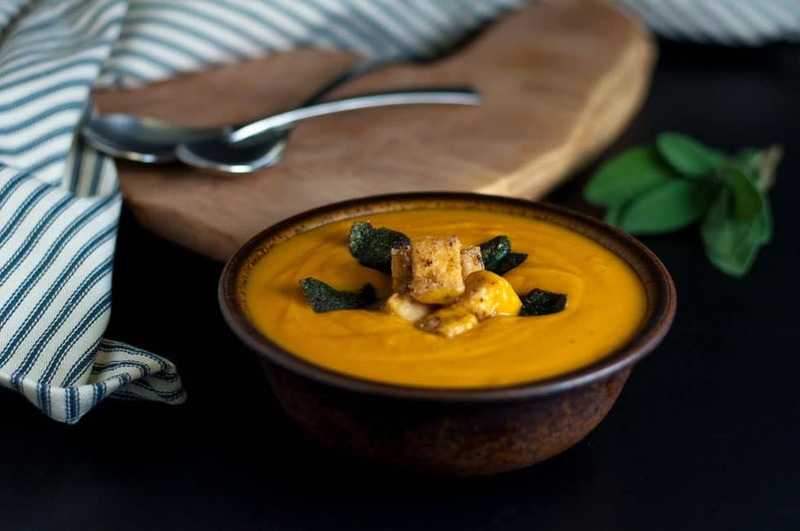 Pack a container of this healthy smoky Chipotle Sweet Potato Soup in your lunch, or come home after work to a warm bowl. Serve with crispy polenta croutons and/or toasted sage leaves. Heat a large pot over medium heat and add oil. When hot, add chopped onion. Sauté until transparent, but don't let them brown. Add chopped sweet potatoes (I sliced mine into 1/4 inch slices so they would cook quickly), chipotle pepper an adobo sauce and vegetable or chicken stock. Simmer until sweet potatoes are tender. Purée in batches in a blender until smooth. To make the polenta croutons, slice store-bought polenta (the kind that comes in a log) and dice into 1/2-inch cubes. Toss with cornstarch and salt. Fry in butter in a small skillet, turning until all sides are crispy and lightly browned. To make toasted sage leaves, heat oil in a small skillet. Add leaves and toast until they turn very dark green and become crisp. Remove and drain on a rack. Garnish soup bowls with sage leaves and/or polenta croutons. Serve immediately. This soup freezes well. Transfer to a freezer container, leaving at least one inch of headroom, label and freeze. 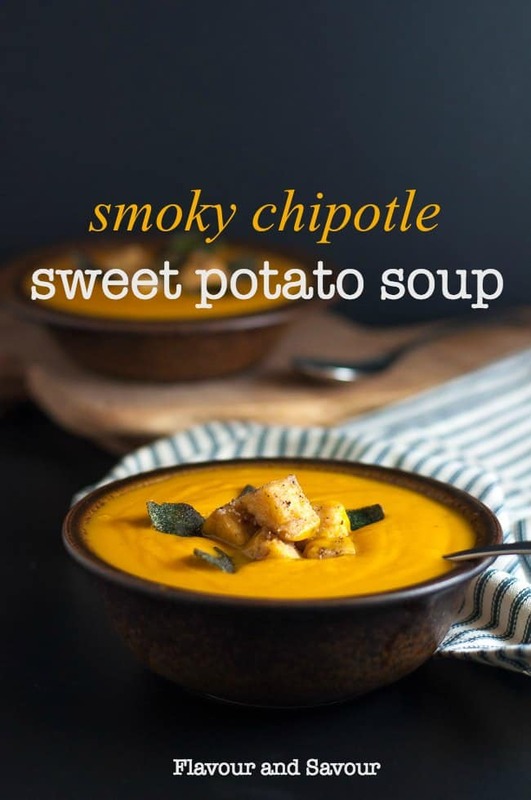 If you like this smoky Chipotle Sweet Potato Soup, try these other healthy soup recipes too. This soup looks so delicious! I love the polenta croutons and the fried sage leaves – YUM! Beautiful photos too! Every Monday I am making soup so I will add this one to the menu! Soup on Mondays is a great idea, Laura. I think I might try that too! 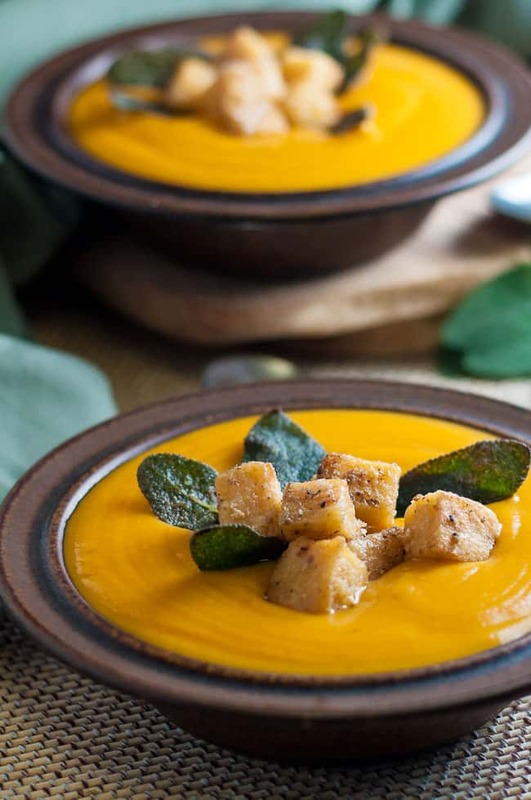 Your soup sounds amazing, but I’m not going to lie … I’m totally taken with your polenta croutons! 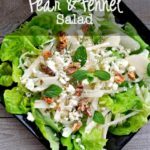 I can see them on so many things including salads. I may need to head off to the kitchen for these stat. Thanks Samantha! I’ve become addicted to them too. So easy, and they’re a great gluten-free alternative to regular croutons. 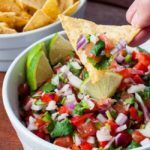 I love anything with chipotle + polenta croutons really do make me swoon – can’t wait to try this out! Those croutons were new to me. Where have I been? Living under a rock?? So good! Thanks Maria! We eat with our eyes first, right?